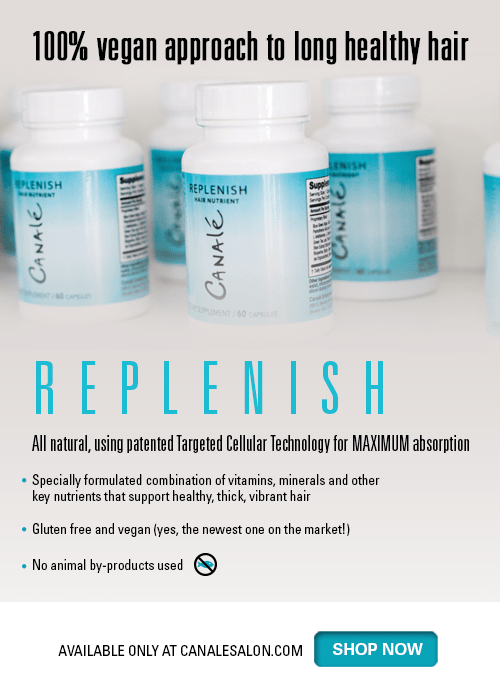 Canalé Products is proud to feature REPLENISH Hair Vitamins. The newest vegan hair nutrient on the market. Created by Master Colorist Michael Canalé himself, REPLENISH is a specially formulated combination of vitamins, minerals and other key nutrients that support healthy, thick, vibrant hair. Vegan, all natural and with no animal by-products used, REPLENISH uses patented Targeted Cellular Technology™ for maximum absorption to provide the ingredients that hair specifically needs. The only one of its kind, Canale’s unique approach to hair vitamins is the best way to achieve healthy hair. Only available here at canalesalon.com — SHOP NOW! REPLENISH Hair Vitamins. Shine on!